Our Memorial Fund was created in 1986. The Memorial Fund allows people to make charitable donations in memory of family and friends. Lakeshore Drive United Church established its Memorial Fund as a means of aiding its Congregation to enhance the Church’s primary missions of worship, pastoral care, Christian development and outreach. Gifts made in memory of a member or friend of the Congregation are deposited in the Memorial Fund. The Fund is managed by the Trustees of the Congregation. Monies from gifts to the Memorial Fund are placed in secure income generating investments. Only the interest from the investments may be used to support the church’s missions. The use of this accumulated interest is at the direction of either the Congregation as a whole or our Official Board. Each year, the names of those who are remembered through the Memorial Fund are included in congregational annual report. 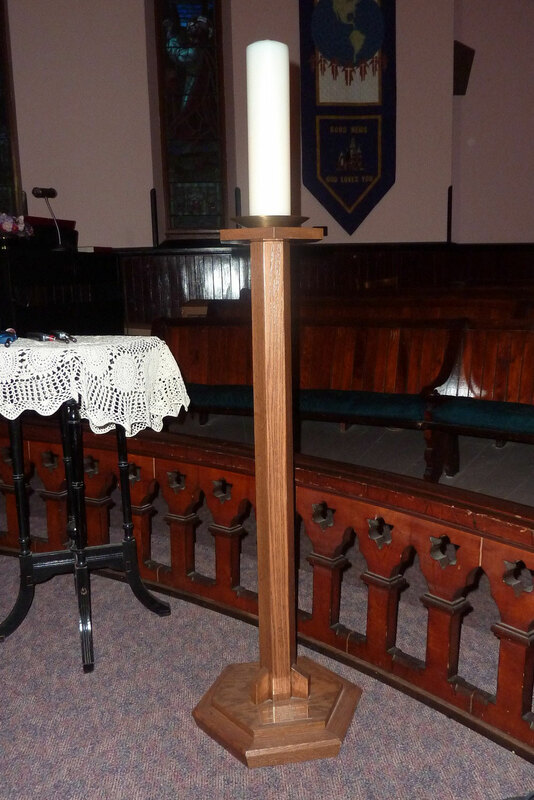 This stand with the Christ Candle shown plus an Advent Wreath for use in Advent were funded by the Memorial Fund and dedicated in memory of The Reverend Donald Smith, Minister of Lakeshore Drive United Church for fourteen years (1986 – 2000). In the left background is the digital piano provided for the sanctuary by the Memorial Fund.